The Yellow Springs Arts Council presents “Hairitage: a Cultural Journey,” an exhibit of drawings and paintings by Central State University Art Instructor Erin Smith. 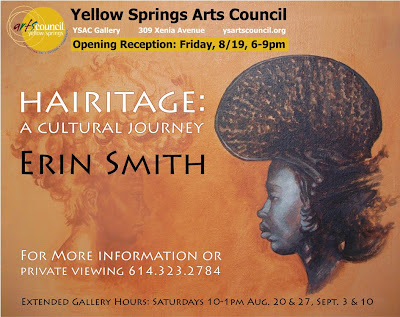 A Third Friday Fling Opening Reception will be held on Friday, August 19, 6-9 p.m. at the YSAC Gallery, 309 Xenia Avenue. This rich exhibit explores issues pertaining to black culture and history. Themes of the show include adornment and how it is perceived historically and applied to contemporary fashion, and natural disasters and their effect on black culture. Extended gallery hours are: Saturdays from 10 a.m. to 1 p.m. August 20, August 27, September 3 and September 10. Call 614.323.2784 for more information or to schedule a private viewing. For more information about YSAC, visit www.ysartscouncil.org.